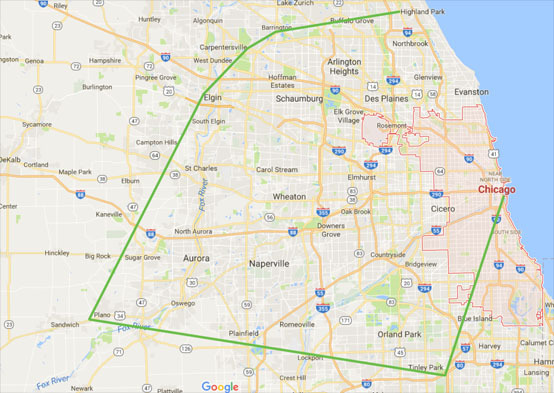 Addison, Alsip, Arlington Heights, Aurora, Bannockburn, Bartlett, Batavia, Bedford Park, Bensenville, Berwyn, Bolingbrook, Bloomingdale, Bridgeview, Broadview, Brookfield, Buffalo Grove, Burbank, Burr Ridge Carol Stream, Cary, Chicago, Cicero, Clarendon Hills, Countryside, Crestwood, Crystal Lake, Darien, Deerfield, Des Plaines, Downers Grove, Elmhurst, Elgin, Elk Grove Village, Elmwood Park, Evergreen Park, Forest Park, Forest View, Franklin Park, Geneva, Glencoe, Glen Ellyn, Glendale Heights, Glenview, Hanover Park, Harwood Heights, Hickory Hills, Highland Park, Hillside, Hinsdale, Hoffman Estates, Inverness, Itasca, Indian Head Park, Justice, Kenilworth, La Grange, La Grange Park, Lemont, Lincolnwood, Lisle, Lombard, Lyons, Maywood, McCook, McHenry, Medinah, Melrose Park, Montgomery, Morton Grove, Mt. Prospect, Mundelein, Naperville, Niles, Norridge, North Aurora, North Riverside, Northbrook, Northfield, Northlake, Oak Brook, Oak Forest, Oak Lawn, Oak Park, Orland Hills, Orland Park, Oswego, Palatine, Palos Hills, Palos Heights, Palos Park, Park Ridge, Plainfield, Prospect Heights, River Forest, River Grove, Riverside, Riverwoods, Rolling Meadows, Romeoville, Roselle, Rosemont, Round Lake, Saint Charles, Sandwich, Schaumburg, Schiller Park, Skokie, South Elgin, Stickney, Streamwood, Sugar Grove, Tinley Park, Villa Park, Volo, Warrenville, Wauconda, Wayne, Westchester, West Chicago, Western Springs, Westmont, Wheaton, Wheeling, Willowbrook, Willow Springs, Wilmette, Winfield, Winnetka, Wood Dale, Woodridge, Woodstock, and Yorkville. If you don’t see your town listed for dog waste removal service, please call our home office at (630) 786-6008.